You can cancel Trial, Monthly & Yearly Subscriptions yourself on the Billing Section of your account when accessing it through your browser. If you signed up for the Mentoring subscription on Apple Store or Google Play store, please follow the guide in this article. Go to the Billing Section of your Mindvalley Account on your internet browser. 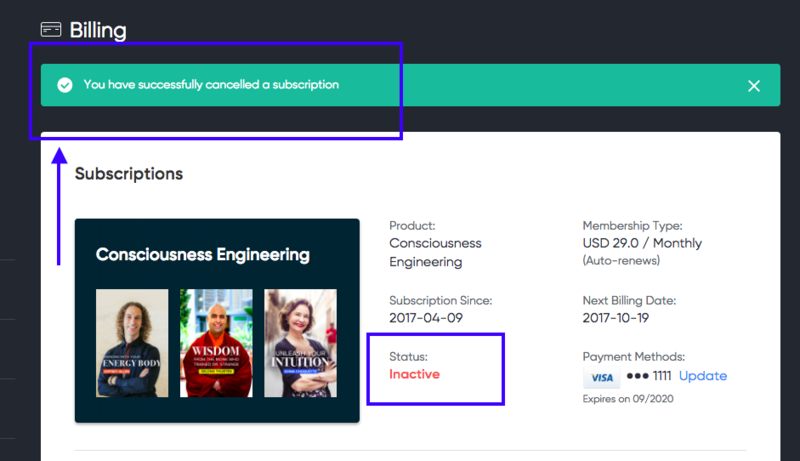 Click on "Cancel Subscription" under "Status"
Once it's done, you will see the status of your subscription in red as "Inactive". You won’t be charged for this program anymore, however, you'll still have access to the content for the period you've already paid for. If your subscription has been cancelled, you can always resubscribe to the subscription by simply repurchasing the subscription service. Please visit this page for more information on all the different subscription services that we offer. Disclaimer: the cancellation and refund policies are always available on our sales and checkout pages.